20 Oct 2017 --- Plum Organics, the organic baby food brand credited with the introduction of the spouted pouch, has launched Baby Bowls: culinary-inspired baby food blends in a spoon-friendly dish. “Making the transition to solid foods is a major milestone for parents and babies. Babies eat with all of their senses, which makes spoon-feeding a great way to start introducing the vibrant hues, textures and complex flavors that are so important for nurturing palate development,” says Dr. Alan Greene, pediatric advisor and member of Plum's Wellness Advisory Panel. “Baby Bowls celebrate interactivity between parent and child with a thoughtful design that showcases the beautiful colors of Plum's recipes,” Greene adds. • Apple, spinach and avocado. • Banana, raspberry and barley. • Beet, apple, strawberry and chia. • Pumpkin, banana, papaya and cardamom. • Apple, blackberry and oat. • Mango, carrot and turmeric. • Pear, cauliflower, cherry and raisin. • Pear, sweet potato and red bell pepper. Plum Organics notes that it is best known for its award-winning design and product innovation. It is credited with shaking up the previously dormant baby food category in 2009 by introducing the flexible pouch format that now makes up 28 percent of all baby food sold in the US market. “It's crucial for us to meet parents where they are by providing a range of delicious organic options for different feeding occasions. As a brand by parents for parents, our goal is to have families' needs covered, whether they're at home or on the go,” Mand continues. 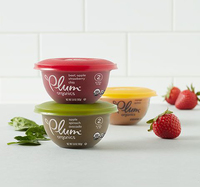 Plum Organics says that Baby Bowls can be purchased at national retailers in the US including Amazon, Target, buybuy BABY, Wegmans, HEB and Kroger, and will continue to roll out at additional retailers in the coming months at a suggested retail price of US$1.29 per bowl.